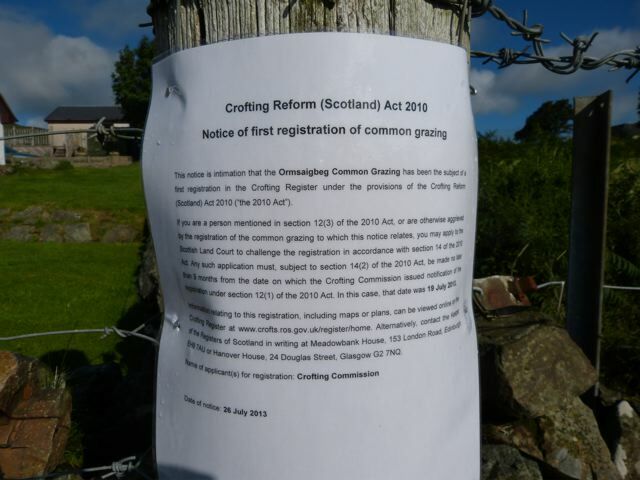 CraigardCroft: Registration of Common grazings and runrig. Registration of Common grazings and runrig. Jon saw this notice in the village today and wondered what it is about. As a result of the Crofting Reform(Scotland) Act 2010, Registers of Scotland are responsible for setting up and maintaining a map based register of crofts, common grazings and runrig. This notice refers to the first registration of the Ormsaigbeg common grazings and is there to ensure that knowledge of the first registration is widespread and that all interested parties are aware. People such as landlords or adjacent land owners might disagree with the boundary as registered. They then have nine months in which to challenge the description of the common grazing boundary in the Scottish Land Court. Runrig (not the band) as a form of cooperative tenancy existed throughout the Hebrides and the crofting counties. Smallholder tenant communities held strips of ploughed land (rigs) in common and each year drew lots to share them out equably as some would be more productive than others. I assume it must still exist in the Outer Hebrides as its included in the 2010 Act.